﻿ Infantry 24H Luminous Sport Date Day Military Army Mens Black Quartz Wrist Watch. 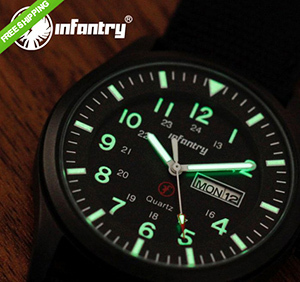 Infantry 24H Luminous Sport Date Day Military Army Mens Black Quartz Wrist Watch. 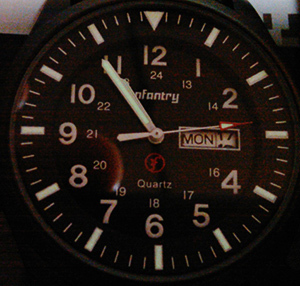 I purchased Infantry 24H Luminous Sport Date Day Military Army Mens Black Quartz Wrist Watch. In the pictures of the description for this watch, clearly seen - luminophor coated on the dial outer ring, arrows and large numbers 1-12 on the dial. Here is the original picture from the description on Ebay auction. In the watches that I have received, large numbers 1-12 on the dial, are not covered by luminophor. Here's a photo of watch that I got in low light. In this picture already visible - big numbers 1-12 without luminophor. The second and third picture made by a camera HTC HD2. Quality of pictures lets you see the problem. Unfortunately this does not allow the camera to take pictures of a higher magnification. With a large magnification can be seen that all the elements of the dial - the numbers 1-12, numbers 13-24, the inscription "Infantry", the inscription "Quartz", covered with plain white paint, not luminophor. By your advice today I bought an ultraviolet lamp. Result of exposure to UV light following photo. Unfortunately the result is worse than after lighting LED flashlight. Arrows illuminate normally only 10 - 15 seconds. Marks on the outer ring of the dial illuminate much worse. Numbers 1-12 is absolutely not illuminate. Please also see the three videos below. This video confirms all what I said. Unfortunately, even if the whole day to keep a watch at the bright sun, ordinary white paint not will shine. Result illumination ultraviolet lamp. On the money I showed marks invisible under normal lighting. 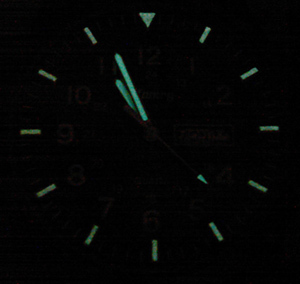 For comparison with the left side watch Seiko tritium, right side watch Seiko luminophore. Even after more than 5 minutes of lighting, numbers 1-12 is not illuminate absolutely. Unfortunately UV lamp can not turn an ordinary white paint in the luminophore. 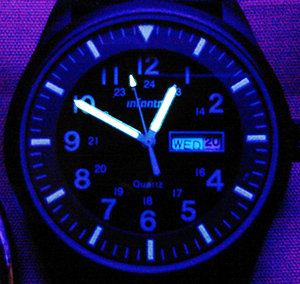 Luminescence arrows and labels of the outer ring of the dial does not exceed 15 - 20 seconds the glow. This is unacceptable short time. I understand that this marriage producer. But check the goods before shipping is the responsibility of the seller. For this reason I would like to receive the dial to be in this watch, luminophor coated big numbers 1-12. All the rest of the watch is very good.